The Episode starts with a flashback scene. 20 years before, Veer’s dad and uncle torture a village man and his daughter. Little Veer and Yash look on. Veer says they are doing wrong. Yash says wrong is happening with us also. Veer asks Rajmata is this true that Lord punished if we do wrong. Rajmata says yes, Krishna came to punish Kans. Veer says why does not Lord punish dad and uncle, they were torturing people. Rajmata says our family is cursed because of this, remember one thing, if anyone does wrong, then he has to bear Lord’s punishment, Lord can come in any avatar to punish the evil doer. FB ends. Archie looks for Veer. She asks Rajmata where is Veer. Rajmata says he is sleeping in my room, he came to my room and lied in my lap, I told him stories. Archie goes and sees Veer sleeping. Kashinath shows Veer to Revati. He asks Revati to see Veer, this is his truth, he has just killed Titu and came here. He says Veer works for us, he will wake up and kill you, don’t make any noise. Revati says it means Veer is part of your family. Kashinath says no, he is the heir of royal family. She asks why is he doing this. Kashinath says our family wasn’t powerful to face them, so we used other people like Rajguru, who wanted revenge on this family. He says Bindal saw Veer’s truth for the first time, 20 years ago, when Bindal went to kill Veer’s dad. FB shows Bindal going to kill Veer’s dad. He sees the king troubling the girl Rani. He misbehaves with the girl. Bindal takes a knife to kill him. The king gets angry and goes to kill her. He kills the girl. He asks soldiers to throw the girl’s body out. Veer sees this and gets shocked. He recalls Rajmata’s words. Bindal hides in the secret passage. He sees Veer. Veer wakes up and kills his dad. He then sleeps. When the family comes there, Veer was shocked as well seeing his dad dead. Veer says I don’t know who has done this. Rajmata hugs him. FB ends. Kashinath says when Veer sees anyone doing wrong, he kills them, recall who killed your husband. Revati says I killed him. FB shows Revati’s husband torturing her. She argues with him. He tries to suffocate her. She pushes him. He falls down and faints. FB ends. Kashinath says Veer had hurt everything and then he went to kill his uncle after you left from the room, Veer didn’t knew this, we got to know this and then we started using him, when we had to kill anyone, we used to show Veer that person is wrong, Veer used to kill that person, we told Veer that Bhuri is doing wrong, so he killed Bhuri, Bhuri signed towards Veer that night, we did the same thing with Titu. Revati says I won’t leave him. Kashinath stops him and says if you go, Veer will kill you, its better you come with me. Dolly cries for Titu. Sharad says Lord has punished him. Sharad argues with Veer. He shows the proof that Titu is the murderer of village girl. Archie gets shocked and says no, Titu can’t do this, you are mistaken. Sharad says you can’t do justice, Kaal Bhairav has come and punished him. Dolly says Neeraj had already told this to us. They cry. Neeraj runs inside the jungle. He falls down. He sees some bright light. He sees Kaal Bhairav coming. He hears the dogs sound. He gets scared. He runs. He reaches the palace and says Kaal Bhairav has come. Kunika asks when did you go out. Neeraj says Lord has sent a message for everyone, the curse is still there and everyone is doing mistake, Lord has come on this land, whoever does crime, Lord will punish them. He hides behind Kunika. She hugs him. Veer and Archie look on. Archie thinks who will be punished now. 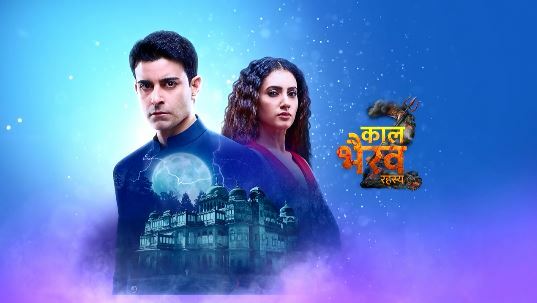 The post Kaal Bhairav Rahasya 2 20th February 2019 Written Episode Update: Kashinath reveals Veer’s truth appeared first on Telly Updates.